Celebrate foliage in a fun way using the Gardman Leaf Trellis. This ornate unit adds a wonderful look to your garden or landscaping, with its three dimensional leaf details and copper and brown hues. Round, vertical rods create a frame and interior support, with a horizontal rod at both the top and base completing the unit. Thinner, curved rods jut from these supports, each culminating in a metal leaf shape to enhance your existing foliage. This forms a loose grid, for your plant tendrils to grip as they grow, and the brushed copper colored finish throughout the item meshes with your landscaping. The two, 12" long legs insert into soil easily, and the all steel construction withstands exposure to the elements. A small orb tops each vertical rod for added geometry, offering an elegant, finished look to the item. 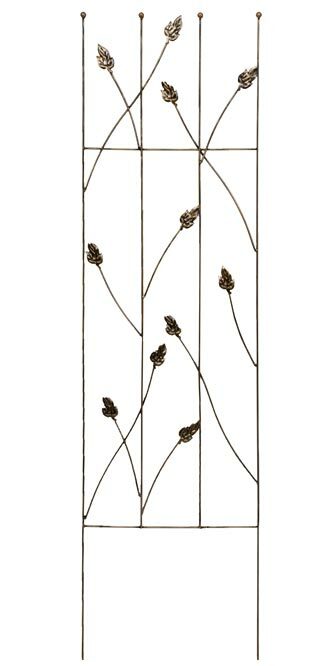 Showcase foliage in your garden throughout the year using this Leaf Trellis.